Barry Lyons (BL): I’d be glad to tell you the pitching rotation for the first three games. Starting tomorrow night in Brockton will be George Lund…. On Friday night, Kyle Dube will be the starting pitcher, home opener…. Lund is pitching Thursday, Dube Friday, and [Steve] Wallace on Saturday. Sunday is To Be Determined. But we will go with a five-man rotation, but these first four games, all the pitchers – we have nine guys right now, we’re expecting two more guys between Friday and Sunday, maybe a third, so our staff is not full yet, but we have three guys that just lost out in the regionals this past weekend that’ll be joining us sometime probably hopefully over the weekend. But the eight, nine guys we have will all get a chance to pitch over the next four games. As far as the position players, I’m very encouraged with what I’ve seen. I like the talent level, I like the enthusiasm, and I’m very excited about this summer and about the ballclub that we have. Of course, there will always be changes over the course of the season, but starting out with, I really like what we have, and I’m confident that these guys are going to work hard and that we’re going to provide an awesome product on the field and in the community. 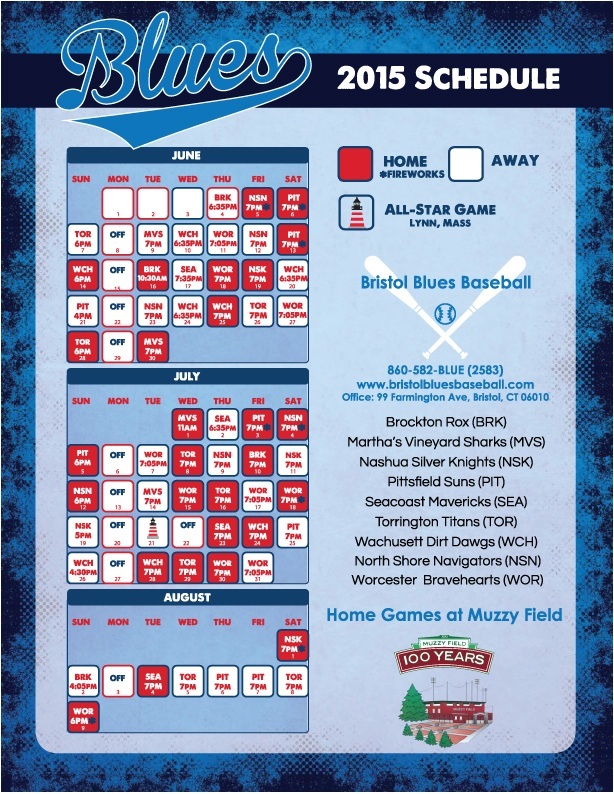 The Bristol Blues organization is first-class, and I’m thankful to be a part of it. Very excited about this summer. I think fans are really going to enjoy coming out and watching this ballclub, being a part of this awesome setting here in Muzzy Field. We’ve got some versatility in all the players as well, which is always a bonus, having guys that play multiple positions and are interchangeable. As I told them, these first two to three weeks, I’m going to do my best to give everyone an opportunity to show what they can do. We’ll mix up the lineup and move guys around, and see how they respond. The guys that produce and really show out will get, obviously, the majority of the playing time, but everyone will play and everyone will get a fair chance to show what they can do. Our goal is to be the best ballclub we can be, come April 1 – I mean, August 1 – as we strive to win a championship. That’s our goal. Q: Is it nice to [inaudible] that this is your birthday? BL: It is, actually, and other than my wife and daughter being here in town with me, I can’t imagine spending it in a better way. I love this ballpark, I love everything about everyone I’ve met within the Blues organization, and I’m excited to be managing again, putting the uniform on and leading young men who are pursuing their goal and their dreams, much as I did many moons ago. It’s an honor and a privilege, and I’m very blessed. It’s an incredible day so far. Q: You’ve been talking about the community. Do you have any idea how you’re going to be involved with the community in Bristol? 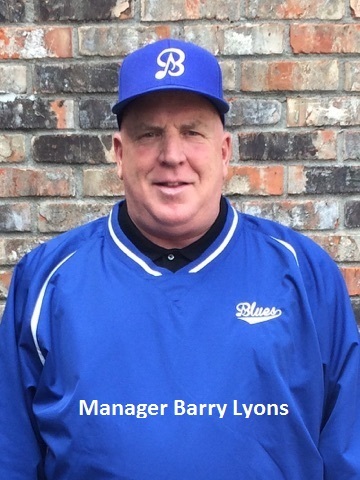 BL: Well, we’re open to anything, and as I told Rick Muntean, the general manager, who’s been here probably since October, maybe, he has had nothing but wonderful things to say about the community and the reception he’s received, and the Bristol Blues have been warmly welcomed here. We have all kinds of special nights planned and promotions and things of that nature, but I’ve been very demanding of our players to be very respectful and to encourage people they meet on a daily basis to come out and watch the Bristol Blues play. We’re willing to do anything to not only blend in in a community, but to help promote this community and to help encourage kids, not just in baseball but in all of their pursuits. I believe the Bristol Blues organization and ballclub are going to make a significant impact in this community this summer, and anything I can do to assure that and to assist in that, I’m willing to do and would love to do. Q: What’s it like for you managing a brand-new team in an area that hasn’t had baseball in a while? BL: Well, it’s a great opportunity to establish our brand and to make a mark in this community and provide wholesome family entertainment and what I want to label as “winning baseball.” We’re not going to win every game, but we’re going to play a brand of baseball that is exciting to watch and entertaining while being aggressive and holding nothing back. We want to win. Every day we put the uniform on, our goal is to win that game that day. Q: Have there been many challenges in bringing together all these players from different colleges and different regions as a team? BL: Not one. Not one challenge at all so far for me as the manager of the club. Now, Rick Muntean I think has done an amazing job of assembling a great group of not only talented ballplayers but fine young men, and that’s not always easy to do. It’s sometimes easy to see the talent when you’re observing the player, but to know that they’re good people and they’re going to represent the organization in a positive way sometimes is the toughest part. But I have great feeling inside and a gut feeling that each one of these kids knows why he’s here and knows what’s expected, and I’ve made that very clear to them over the first five days. But I do want to say Rick Muntean has been in the business 30 years, and putting this whole thing together, a lot of it has fallen on him, and I think he’s done an amazing job. We have worked very well together so far and I expect that to only improve and to grow over the course of the summer. The ownership group has made me really feel special and has put me in a great position to do what I love to do, and I’m very thankful for that. Q: With the changes that are being made in Major League Baseball, with statistics, new metrics of measurement, new pace of play rules, what is your opinion on those? Do you see that as being a positive change, or…? BL: I guess my first instinct, to see a clock put in baseball, to me is… disturbing, I’m going to be nice. That is the one element of the game I don’t think they need to screw with. But due to TV and selling advertising and marketing and creating revenue, that’s what it’s come to. But the purist in me, and the passionate baseball lifer that I am, I don’t like that. And some of the quote-unquote “sabermetrics” or these newly-found ways of measuring things… I don’t understand ‘em. At all. I don’t care for ‘em, I don’t use ‘em. I manage by gut instincts and by knowledge and wisdom gained in my fifty-plus years in baseball. As I told these guys: Be aggressive, attack the baseball as a hitter. I’m not into the walks – I mean, I love my walks, don’t get me wrong, but I’m not into just getting up there, taking pitches, and trying to work the count, and trying to get that “perfect pitch.” I think that has led to a lot of the strikeouts that you see these days. Guys are getting behind in the count by taking good pitches to hit because they’re borderline or they’re not right down the middle or they’re not right where they want it, and to me, I don’t agree with that style of baseball – with that approach to hitting – at all. I was a very aggressive hitter and I attacked that first pitch if it was presentable. Don’t get me wrong, I swung at a lot of bad pitches in my career, but I can promise you I never took a 2-0 fastball down the middle. I never took a 3-1 fastball anywhere near home plate. Rarely did I not attack a first-pitch fastball unless it was obviously blatantly outside or what have you. I believe in being aggressive, and if a kid is aggressive and making mistakes, I have no problem whatsoever. If a kid’s passive or makes a mental mistake or is not focused, then we’ve got issues, and we’ll address it, and he’ll learn from it.